Authentication is a basic security requirement for any computing environment. In simple terms, users and services must prove their identity (authenticate) to the system before they can use system features to the degree authorized. Authentication and authorization work hand-in-hand to protect system resources. Authorization is handled in many different ways, from access control lists (ACLs), to HDFS extended ACLs, to role-based access controls (RBAC) using Sentry. See Authorization Overview for more information. Several different mechanisms work together to authenticate users and services in a cluster. These vary depending on the services configured on the cluster. Most CDH components, including Apache Hive, Hue, and Apache Impala can use Kerberos for authentication. Both MIT and Microsoft Active Directory Kerberos implementations can be integrated for use with Cloudera clusters. In addition, Kerberos credentials can be stored and managed in the LDAP-compliant identity service, such as OpenLDAP and Microsoft Active Directory, a core component of Windows Server. This section provides a brief overview with special focus on different deployment models available when using Microsoft Active Directory for Kerberos authentication or when integrating MIT Kerberos and Microsoft Active Directory. Cloudera does not provide a Kerberos implementation. Cloudera clusters can be configured to use Kerberos for authentication, either MIT Kerberos or Microsoft Server Active Directory Kerberos, specifically the Key Distribution Center or KDC. The Kerberos instance must be setup and operational before you can configure the cluster to use it. Gathering all the configuration details about the KDC—or having the Kerberos administrator available to help during the setup process—is an important preliminary task involved with integrating the cluster and Kerberos regardless of the deployment model. In simple terms, Kerberos is an authentication protocol that relies on cryptographic mechanisms to handle interactions between a requesting client and server, greatly reducing the risk of impersonation. Passwords are not stored locally nor sent over the network in the clear. The password users enter when logging in to their systems is used to unlock a local mechanism that is then used in a subsequent interaction with a trusted third-party to grant a user a ticket (with a limited lifetime) that is used to authenticate with requested services. After the client and server processes prove their respective identities to each other, communications are encrypted to ensure privacy and data integrity. The trusted third-party is the Kerberos Key Distribution Center (KDC), the focal point for Kerberos operations which also provides the Authentication Service and the Ticket Granting Service (TGS) for the system. Briefly, the TGS issues a ticket to the requesting user or service which is then presented to the requested service that proves the user (or service) identity for the ticket lifetime (by default, 10 hours). There are many nuances to Kerberos, including defining the principals that identify users and services for the system, ticket renewal, delegated token handling, to name a few. See Kerberos Security Artifacts Overview. Furthermore, these processes occur for the most part completely transparently. For example, business users of the cluster simply enter their password when they log in, and the ticket-handling, encryption, and other details take place automatically, behind the scenes. Additionally, users are authenticated not only to a single service target, but to the network as a whole thanks to the tickets and other mechanisms at work in the Kerberos infrastructure. Credentials needed for Kerberos authentication can be stored and managed in an LDAP-compliant identity/directory service, such as OpenLDAP or Microsoft Active Directory. At one time a stand-alone service offering from Microsoft, Active Directory services are now packaged as part of the Microsoft Server Domain Services. In the early 2000s, Microsoft replaced its NT LAN Manager authentication mechanism with Kerberos. That means that sites running Microsoft Server can integrate their clusters with Active Directory for Kerberos and have the credentials stored in the LDAP directory on the same server. This section provides overviews of the different deployment models available for integrating Kerberos authentication with Cloudera clusters, with some of the advantages and disadvantages of the available approaches. This approach uses an MIT KDC that is local to the cluster. Users and services authenticate to the local KDC before they can interact with the CDH components on the cluster. An MIT KDC and a separate Kerberos realm is deployed locally to the CDH cluster. The local MIT KDC is typically deployed on a Utility host. Additional replicated MIT KDCs for high-availability are optional. 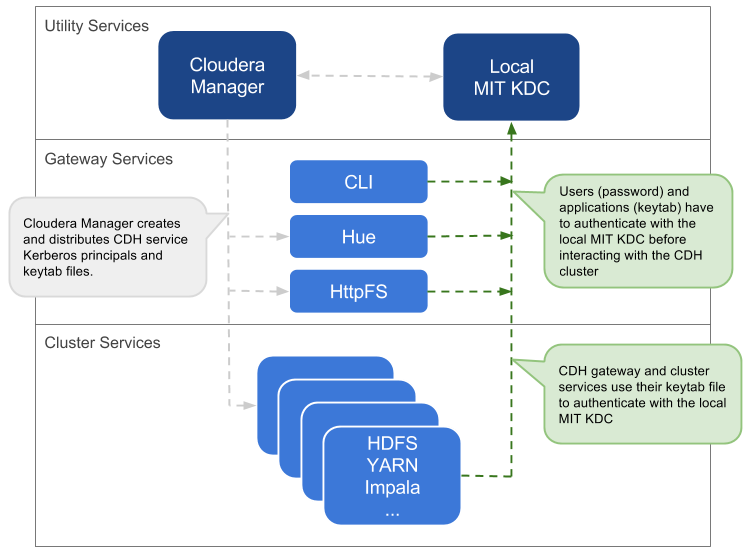 Cloudera Manager connects to the local MIT KDC to create and manage the principals for the CDH services running on the cluster. To do this Cloudera Manager uses an admin principal and keytab that is created during the setup process. This step has been automated by the Kerberos wizard. See Enabling Kerberos Authentication Using the Wizard for details, or see How to Configure Clusters to Use Kerberos for Authentication for information about creating an admin principal manually. The local MIT KDC administrator typically creates all other user principals. However, the Cloudera Manager Kerberos wizard can create the principals and keytab files automatically. Service principals should be created in the local MIT KDC and the local Kerberos realm. 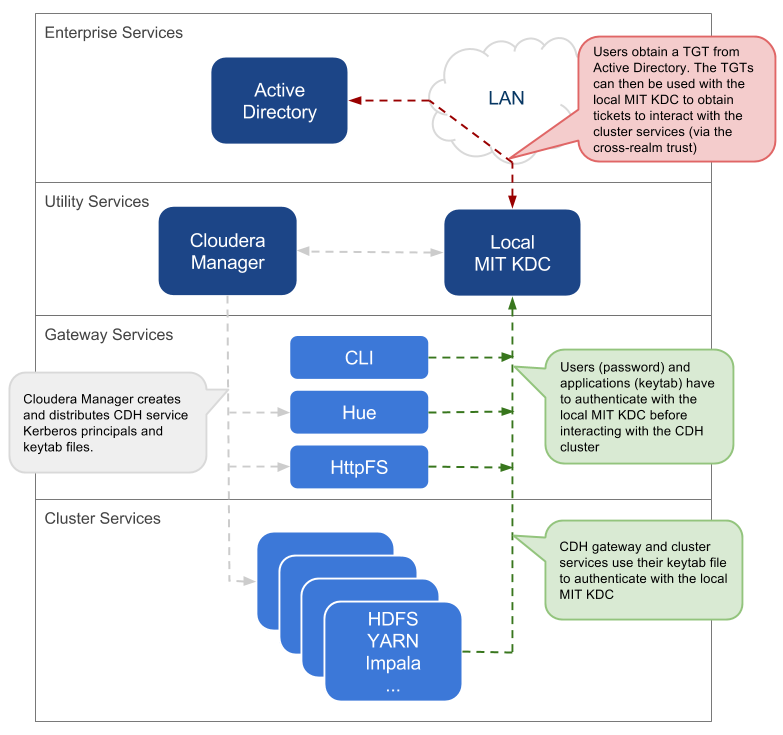 Cloudera Manager connects to the local MIT KDC to create and manage the principals for the CDH services running on the cluster. To do this, Cloudera Manager uses an admin principal and keytab that is created during the security setup. This step has been automated by the Kerberos wizard. As a general guideline, Cloudera recommends using a dedicated Active Directory instance (Microsoft Server Domain Services) for every 100 nodes in the cluster. However, this is just a loose guideline. Monitor utilization and deploy additional instances as needed to meet the demand. In general, Cloudera recommends setting up the Active Directory domain controller (Microsoft Server Domain Services) on the same subnet as the cluster and never over a WAN connection. Separating the cluster from the KDC running on the Active Directory domain controller results in considerable latency and affects cluster performance. Principals and Keytabs - In a direct-to-AD deployment that is set up using the Kerberos wizard, by default, all required principals and keytabs will be created, deployed and managed by Cloudera Manager. However, if for some reason you cannot allow Cloudera Manager to manage your direct-to-AD deployment, then unique accounts should be manually created in AD for each service running on each host and keytab files must be provided for the same. These accounts should have the AD User Principal Name (UPN) set to service/fqdn@REALM, and the Service Principal Name (SPN) set to service/fqdn. The principal name in the keytab files should be the UPN of the account. The keytab files should follow the naming convention: servicename_fqdn.keytab. The following principals and keytab files must be created for each host they run on: Hadoop Users (user:group) and Kerberos Principals. The Kerberos keytab file is transmitted among the hosts in the Cloudera Manager cluster, between Cloudera Manager Server and Cloudera Manager Agent hosts. To keep this sensitive data secure, configure Cloudera Manager Server and the Cloudera Manager Agent hosts for encrypted communications using TLS/SSL. See Encrypting Data in Transit for details. Cloudera does not provide a Kerberos implementation but uses an existing Kerberos deployment to authenticate services and users. The Kerberos server may be set up exclusively for use by the cluster (for example, Local MIT KDC) or may be a distributed Kerberos deployment used by other applications in the organization. Regardless of the deployment model, the Kerberos instance must be operational before the cluster can be configured to use it. 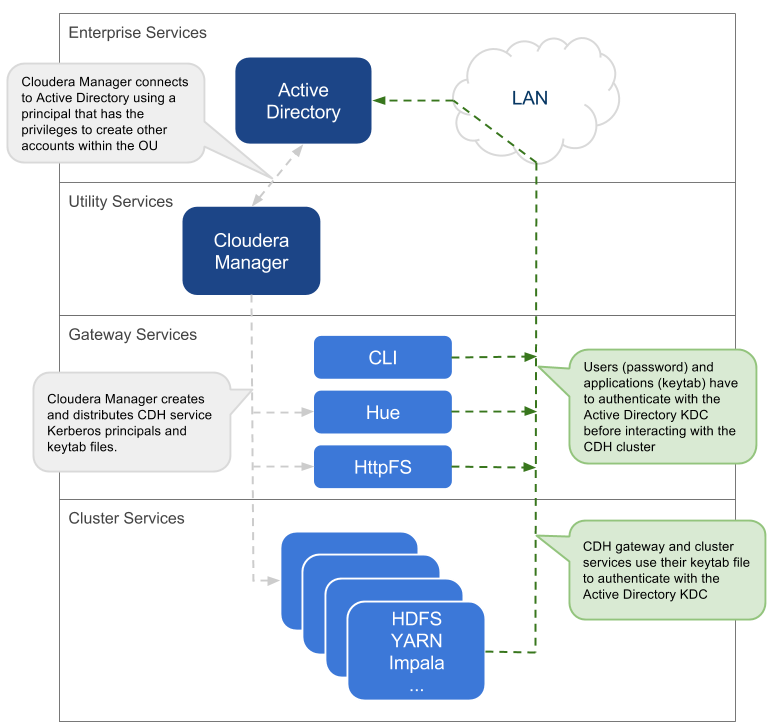 In addition, the cluster itself should also be operational and ideally, configured to use TLS/SSL for Cloudera Manager Server and Cloudera Manager Agent hosts, as mentioned above.